BIG SALE. Each of these DVDs sells separately for over $50. LEARN SHAOLIN WHITE CRANE KUNG FU AND ITS ICONIC WEAPON,THE SAI! Three-DVD set. 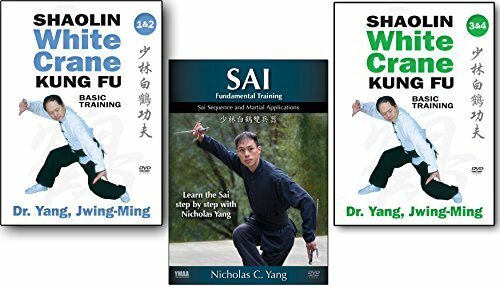 DVD1 includes Kung fu fundamentals, history of White Crane Kung Fu, basic qigong, stances, movements, Jin patterns, hand techniques, & the Qi Xing Quan sequence with martial applications. DVD2 includes Solo and Partner Kung Fu Basics, Sparring, and the Bridge Hands and Shan He Quan Sequences with Martial Applications. SAI DVD includes training drills, martial applications, and double sai sequence. If you have any questions about this product by YMAA, contact us by completing and submitting the form below. If you are looking for a specif part number, please include it with your message.